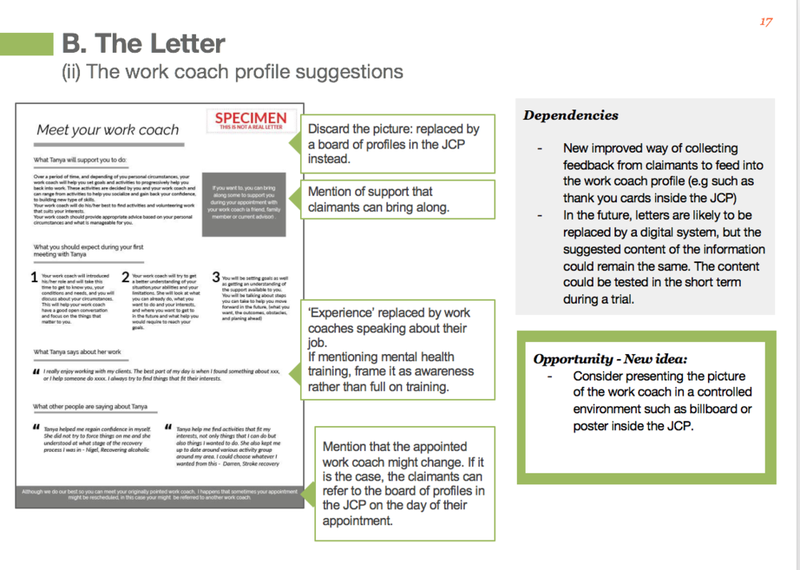 Policy lab and DWP to better understand what drives more meaningful engagement with Jobcentre Plus services from people with health conditions or disabilities. Evidence shows that where claimants engage voluntarily with support this tends to lead to more positive outcomes. The DWP wanted to find out how to encourage and increased voluntary engagement. The Policy Lab in the Cabinet Office is working with the Department for Work & Pensions (DWP) on a project to develop positive engagement between people with health conditions and disabilities who are out of work, claiming benefits and the DWP staff who support them. Policy Lab partnered with Uscreates to better understand and evaluate the Jobcentre Plus (JCP) user journey and identify opportunity areas to improve engagement with claimants with health conditions, and co-design ideas and develop them into paper prototypes to test in ‘real world’ situations and refine based on feedback. Uscreates worked collaboratively with Policy Lab, co-delivering workshops and including the team in weekly huddles and prototyping support activities. Based on the opportunity areas identified by the research, we held co-design sessions with members of core teams (DWP, JCP work coaches, other stakeholders etc). First round of ethnographic films were done by policy lab > then Uscreates did all the ideas. Based on the ethnographies and the claimants journey, the insights were gathered under 5 opportunity areas. These opportunity areas were used as a base to guide the co-design session with the stakeholders. 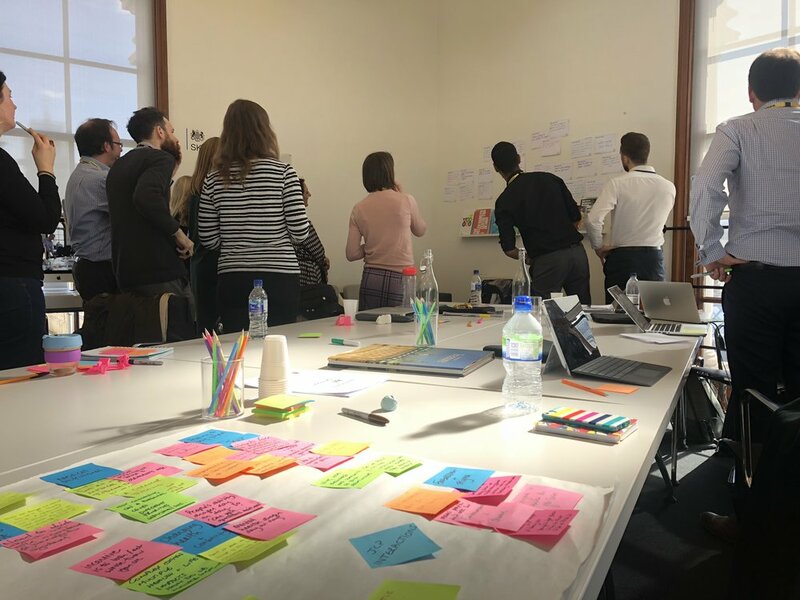 During the co-design session, teams came up with a number of ideas under each opportunity area and have been prioritised (based on feasibility, desirability and viability) to be taken forward to initial concept prototyping. We then used the insights from the research to collectively develop ideas to improve engagement – we started off with a range of options and then refined down. There was a real buzz in the session with frontline practitioners and policymakers in the magnificent SKYroom at the Cabinet Office. We used rapid prototyping as a research and communication method and created early-stage prototypes to help us test and verify user needs for new products. Following the depth research we held a number of insights sharing and design sessions with claimants, disability organisations and frontline staff working with Uscreates and Policy Lab. Phase 1: Testing with 3 claimants in 121 interviews To ensure we got claimant’s perspective at the co-design stage, we tested the initial concepts as simple sketches, giving permission to the claimants to modify and interpret ideas as they wished. Phase 2: Testing with work coaches in Barnsbury and in Birkenhead). Based on claimants’ feedback, the ideas were prioritised and refined to higher fidelity prototypes. We de-prioritised ideas which overlapped with existing initiatives and concentrated on new concepts. SRINT 3 - Prototyped and tested these ideas with claimants in 2 JCP locations (Barnsbury, London and Birkenhead, Liverpool). The final recommendations stem from a shared consensus, and a combination of all feedback received during prototypes sessions. The final round of prototypes were a series of interventions at specific points along the journey, with the objectives of improving claimant’s understanding and trust of the process before the initial appointment, improving the setting in which the first interaction took place, and shaping tools to build trust and facilitate ongoing interactions. The DWP has now a range of prototypes to test. and shared the HCP approach with colleagues across DWP who are keen to learn more.